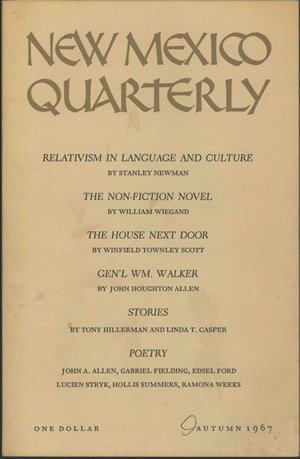 This is the Autumn 1967 (XXXVII, number 3) issue of New Mexico Quarterly containing the short story "The Replacement" by Tony Hillerman. The story takes place during World War II in a town in Alsace, on the border between France and Germany. New Mexico Quarterly was published by the University of New Mexico Press and contains work by UNM students and faculty. This issue has a plain tan paper cover with the journal title printed in a darker shade of tan. The front cover lists selected contents. The back cover contains the journal title printed in the same color and typeface as the front cover, and is otherwise blank. The inside front and inside back covers are blank. Title Page Transcription: Volume XXXVII, Number 3 - Autumn 1967 | NEW MEXICO QUARTERLY | Published by the University of New Mexico | drawing | MARY E. ADAMS AND GUS BLAISDELL, Coeditors | LEONARD A. PREHN, Production | OUIDA NELSON, Circulation Manager | © 1967 THE UNIVERSITY OF NEW MEXICO PRESS | PUBLISHED QUARTERLY | COMPOSED, PRINTED AND BOUND IN THE UNITED STATES OF AMERICA AT THE | UNIVERSITY OF NEW MEXICO PRINTING PLANT. ENTERED AS SECOND-CLASS | POSTAGE PAID AT ALBUQUERQUE, NEW MEXICO, 87106. OPINIONS EXPRESSED | OR IMPLIED BY CONTRIBUTORS DO NOT NECESSARILY REFLECT THE VIEWS OF THE | EDITORS OR OF THE UNIVERSITY OF NEW MEXICO. SUBSCRIPTIONS: ONE | YEAR, $5.00; TWO YEARS, $9.00; THREE YEARS, $12. SINGLE COPY, $1/25. BACK | ISSUES, $1.50. FOREIGN, SAME PRICE AS DOMESTIC. ADDRESS: NEW MEXICO | QUARTERLY, THE UNIVERSITY OF NEW MEXICO PRESS, ALBUQUERQUE, NEW | MEXICO 87106, U.S.A. Binding: Two-color paper covers. NEW MEXICO QUARTERLY XXXVII: 3 AUTUMN 1967 printed on the spine.